The first time we met Lily it was clear she was the rowdiest pup in her litter of four. She bounced around the other puppies, constantly nagging them to wrestle and smiling an ebulliently happy golden retriever grin as she pinned them, then rolled in the dirt, then beseeched them to play some more. It’s been eleven years – and countless life changes – since we brought Lily home. 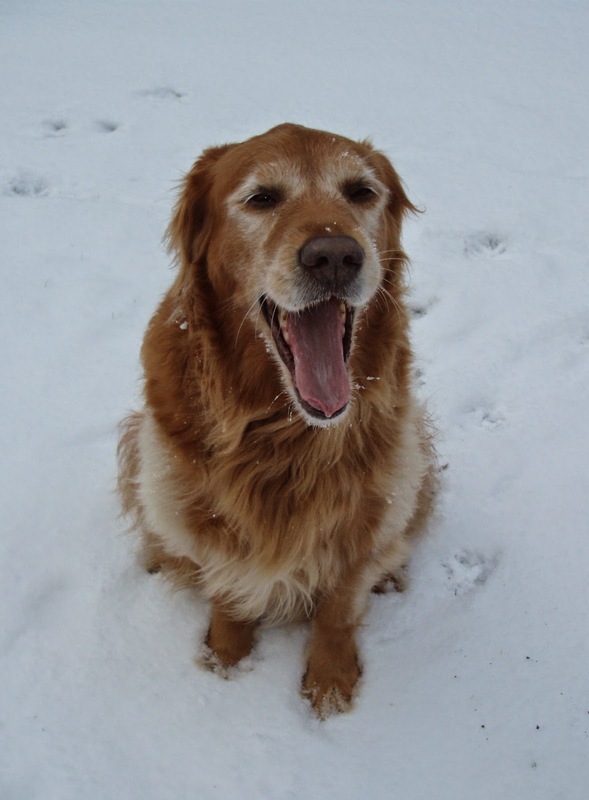 While our golden girl’s muzzle has whitened and her step is not quite so spry as it was a decade ago, Lily maintains the lovable feistiness she radiated as a puppy. When she was tiny and newly ours and we’d take her on walks up the dirt driveway, Lily would sprint as fast as her clumsy puppy feet would allow before flopping down superman style, front legs stretched out before her, back legs flattened behind, and a look of sheer disbelief that she still had so far to travel. After a brief pause, she’d be up again and running with wild abandon for a few more yards. Lily’s curiosity and zest for a good time landed her in some tight spots when she was a pup. She once crawled into the culvert under our driveway and was briefly – but alarmingly – stuck. Somehow we managed to coax her through to the far side, since she couldn’t back up and we couldn’t get in to reach her. She still looks longingly into culverts, although she soon grew too big to explore them. Lily has accompanied us through all the changes that passing time brings. When we first brought her home, she had to learn to live with two cats – and found out the hard way that cats have sharp claws and short tempers. Before she was quite full grown, we moved to a different house, with lots of new scents, new things to chew, and fish to catch from a garden pond – which, inspired by Lily’s fishing adventures, we soon filled in to make a patio. She donned a pretty purple collar one hot, late August day and stood with us – and our family and friends – in the field between the house and the mountains as we were married. And when she was not quite three years old, we came home one day with two tiny, wiggly bundles of unfamiliar smells and noises. We were entirely preoccupied with these mysterious creatures, often too tired to give belly rubs. Regardless, in typical golden fashion, Lily set out to love these new members of the pack. For the first week or so, whenever one of them would fuss or start to cry, Lily would come closer to investigate, offering her help (but obviously unsure what to do). Turns out two babies can make a lot of noise for a surprisingly large part of the day and night, and soon poor Lil simply retreated from the crying in search of a quiet spot to rest. How often during those exhausting days I wished I could go with her, curl up, fall asleep and dream the day away. Before long there was another baby, and as kids and dogs are wont to do, they have all become buddies, although the old dog still retreats sometimes from the clamor. But Lily knows the children now measure the food into her bowl twice a day and feed her sandwich crusts after lunch. They rub her ears and her belly. They take her for walks through the woods and throw sticks into the cool brook for her to retrieve. Many mornings she comes with me to see the children off to school. It is a sad reality that our canine companions age so much more quickly than we do. When we brought Lily home, I was barely 30 and she was barely weaned. Now I am in the nebulous realm of middle age, while she is something like 70 in golden retriever years. As the children have grown more independent in recent years and my work has evolved into a mostly home-based venture, Lily and I have settled increasingly into a rhythm of togetherness. She will no longer climb the stairs to the third-floor office, and so I find space at the dining room table to work, preferring both the warmth of downstairs and the easy company of the dog. When I sit down to write, she lies nearby and is soon breathing the soft, sighing snore of an old dog. Now and then she places her head on my lap and stares at me from deep brown eyes, now enveloped in a mask of white, beseeching me to stop typing and pet her or take her for a walk. Usually, eventually, I give in and we head into the woods together, she sniffing a dog’s treasure trove of delightful forest smells and I appreciating the a mind-clearing break and the quiet companionship of a good dog. And so I alter my pace when I can, as Lily once did for me, so that we can go together. Sometimes we just head out into the yard for a few minutes or take a short loop around the field. This she can do alone – and often does, barking out toward the woods to let the wild things know this is her territory. But she seems to like the human company – and the possibility of a longer adventure. On our walks, whether brief or ambling, Lily will sometimes lag behind, investigating a particularly interesting scent. When I turn to call her, she comes bounding my way, ears back, eyes laughing, tongue hanging sideways from a smiling mouth. In that happy stride she still looks like the puppy we brought home one spring day a lifetime ago: a little bit wild, infectiously joyful, and always ready to play. Original content by Meghan McCarthy McPhaul, posted to her Blog: Writings From a Full Life. This essay also appears as Meghan's Close to Home column in the January 23, 2015 edition of the Littleton Record. The garden fence will need fixing come spring. We enclosed our vegetable plot years ago, primarily to keep the dog – and later the toddling children – out of the plants growing there. The wire fencing has been sagging for a while now, between the sturdy wooden posts. But this early winter the fence has been pushed from merely drooping to downright dilapidated by regular visits from a neighborhood deer. We first spotted her from an upstairs window at the back of the house, the week before Thanksgiving. A shape shifting in the dusk drew my eyes to the rectangle of field enclosed by that slightly sagging fence, where the doe was pacing and sniffing around the garden near the compost heap. The pumpkins that had been our Halloween jack-o-lanterns were at the top of the pile, broken into softening shards, their autumn orange fading but still bright against new snow. I called the kids – now far beyond their toddling days – and we peered into the growing dark to watch the deer as she examined the fence, repeatedly lowering her head to sniff at its edge, then wagging her ovate tail in apparent frustration, the discarded pumpkin bits just out of her reach. Two days later she was back, this time as light crept into the day rather than out of it. She repeated the routine of pacing, sniffing and tail wagging. After several minutes of deliberation and scouting her options, the doe gave a final tail wag, twitched her big ears, and with easy grace hopped the leaning garden gate. She stayed within the garden, munching composted pumpkin, until the dog went outside 20 minutes later. We see deer often in the fields around our house, along with the narrow paths they trod from the field into the cover of the forest. Some seasons we are able to identify the regular cervine visitors to the old apple orchard in the field. Last fall we enjoyed daily visits from a large doe and two smaller ones who came together, always a trio, to pick at the fallen apples or stretch their necks to reach the fruit still clinging to branches. Often they were joined by a young buck who sported only a single spike. There was an abundance of apples last year, and even after snow had covered the field, the deer came to scrape through the white in search of the frozen morsels below. On the very morning after the last day of the final hunting season, a six-point buck strode regally through the field toward the mountains, not bothering to pause for apples. We’d never seen him before and haven’t since. This year the apples were not as plentiful, and we haven’t seen deer as often in our field. 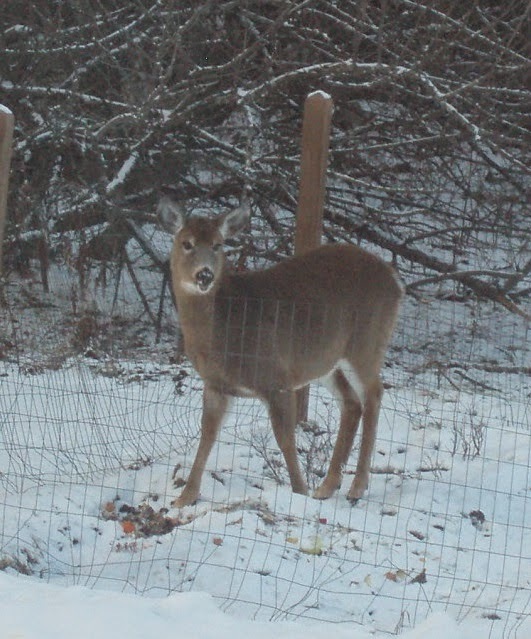 Our winter deer, the one who raids the compost heap, seems to be our only regular for this season. Often at dusk or before the morning has fully brightened to day, we’ll notice her large ears and twitching tail in the garden out back. She has become quite bold, actually, and we often find her standing just beyond the garden, gazing thoughtfully at us as we come down the driveway after school in the afternoon. By the time we are out of the car and in the house, the deer is in the garden. She stoops to nose the pile, searching for the best scraps – carrot peels, stalks of wilted lettuce, browned apple cores, perhaps – then raises her head as she chews placidly, dark eyes rimmed in white surveying the landscape, ears turning toward every sound. When we open the door to let the dog out, the deer is immediately alert, and with one smooth, powerful leap she is over the fence and out of the garden, her white tail waving with each high bound through the field. She is lovely to watch, and our compost scraps seem easy picking in what must be, for a deer, a very long, hungry winter. But I know we’ll have to break our winter deer’s bad habit. I wonder, as I watch her in my garden out back, if this is the deer who ate the tops off every carrot in the small garden boxes in the side yard, and nibbled every lettuce down to the stalk there as summer faded to fall months ago. There are no fences around those boxes, and we’d never had an issue with wild vegetable thieves before last year. Perhaps it’s time to enclose those veggies, too. Yes, the garden fence will need fixing come spring, and maybe a jolt of electricity added as well. Original content by Meghan McCarthy McPhaul, posted to her Blog: Writings From a Full Life. This essay also appears as Meghan's Close to Home column in the January 9, 2015 edition of the Littleton Record.